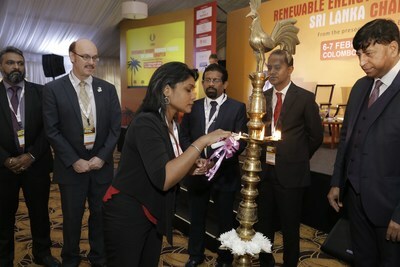 UBM India, the leading B2B exhibition organizer held the 2nd edition of Renewable Energy Growth Forum (6th – 7th February 2019) supported by the Ceylon Chamber of Commerce and Industries at the Taj Samudra, Colombo, Sri Lanka. The forum discussed the potential of the Renewable Energy (RE) industry, policies and trends, global market overview, renewable energy opportunities in Sri Lanka, project financing and beyond. The Renewable Energy Growth Forum is one of the most comprehensive and reputed platforms backed by the excellence UBM has in the fraternity with the Renewable Energy India Expo – Asia’s largest and most influential exhibition and other events across Saudi Arabia, Dubai, Vietnam and Thailand, amongst others. The event was inaugurated by key dignitaries, Mr. Sulakshana Jayawardena, Director (Development), Ministry of Power and Renewable Energy, Government of Sri Lanka; Mr. Damitha Kumarasinghe, Director General, Public Utilities Commission of Sri Lanka; Mr. Vinay Rustagi, Managing Director, Bridge to India Energy Private Limited, and Mr. Rajneesh Khattar, Group Director, UBM India Pvt. Ltd.
Over the course of 2 days, companies dealing in solar and wind products, installers, enterprises, banks, investors, utilities, power producers, rooftop and ground mounting solution providers, system integrators, importers and exporters, and freight forwarder among other supply chain groups and Government officials joined hands to address the demand of electricity and futuristic technologies. The international forum had participation from speakers such as B.M.S Batagoda, Secretary to the Ministry of Power and Renewable Energy, Govt of Sri Lanka; Damitha Kumarasinghe, Director General, Public Utilities Commission of Sri Lanka; Athula Jayathunga – Director ( Renewable Energy), Sri Lanka Sustainable Energy Authority; Dr. P.S.N. De Silva, Head of Engineering, Lanka Electricity Company (Private) Limited; R.Chellappan, Managing Director, Swelect Energy Systems Limited; Santosh Khatelsal,Managing Director, Enerparc Energy; P. Vinay Kumar, CEO, Varp Power Pvt Limited; Siddharth Malik, Managing Director, Megawatt Solutions Pvt Ltd; Ishani Palliyaguru, Assistant Vice President – Project Finance, National Development Bank PLC; Rohit Kumar, Head of Indian Subcontinent, Renewable Energy Corporation (India) Private Limited; M.R. Narayanan, Director, Southern Floating Solar Pvt. Ltd; Shehan Talagala, Sales Manager, Sri Lanka, Jinko Solar; Gagandeep Kaur, Sales Head, Future Hi Tech Batteries Limited; and Sampath Kariyawasam,General Manager – Service, Siemens Gamesa Renewable Energy Lanka Private Limited, amongst others. The 2nd edition of the Renewable Energy Growth Forum 2019 is organised by UBM, which in June 2018 combined with Informa PLC to become a leading B2B information services group and the largest B2B Events organiser in the world. Please visit http://www.ubm.com/global-reach/ubm-asia for our presence in Asia. Please visit http://www.ubm.com/asia for more information about our presence in Asia.